Lewis Wolfe was born in Coplay, Pennsylvania on October 26, 1895. He was filled with life, vitality and had a keen sense of family responsibility. The family was the center of social activities. Though he only had an eighth grade education, he read widely and was well versed in many topics. He married Jennie Mae Keiper on April 24, 1920. They had three children; Virginia Mabel Wolfe, Lewis 'Sonny' Wolfe, and Paul Milton Wolfe who only lived for five days. He died on September 29, 1977 at the age of 81. After Lewis was born on October 25, 1895, his family moved to Cemeton, PA in 1900. In 1905, the family moved to Nazareth, PA and first lived on Spring Street, then Broad Street, until they bought a house on Belvedere Street. Lewis began working at age 14 at Kramer's Hosiery which was a textile mill in Philadelphia, Pennsylvania. In 1914, when President Wilson was elected, the mill shutdown. Lewis then moved to Reading for three weeks and did not like being there. He then moved back to Nazareth where he worked in the Penn Allen cement mill at the age of 16 years. 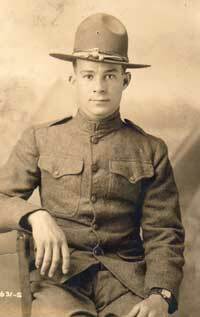 In November of 1917, Lewis enlisted in the U. S. Army Signal Corps and was assigned to the Balloon Corps where he went to San Antonio, Texas for one month. He returned to Camp Morrison, Virginia, where he was preparing to go overseas during World War I. He then deployed to Europe in March 1918 from Newport News, Virginia on the USS Saboney. It took fifteen days to arrive in Europe and was he seasick most of the trip. 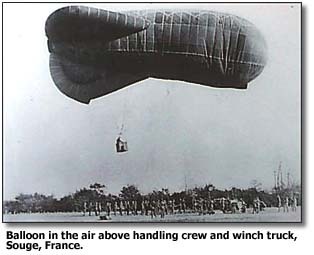 They arrived in Brest, France where he disembarked and headed for Bordeaux, France where they trained artillery officers in balloon operations. He then moved to Nancy, France where Toule Sector and was a quiet front. He then moved to Meuse Argonne which was not a quiet front, lots of fighting going on. Then he went to Châteaux, They where the Crown Prince had his headquarters. The company was down to ninety men because of the fighting that was going on. He then went to the Battle of Metz which was in a different sector. They went to Rest Camp before the Battle of Metz which never started because of the Armistice. While they were at Rest Camp the Armistice was signed on November 11, 1918. They were not paid while they were in France. He was granted five days leave which was his first leave and he planned to spend time in Nice, France. However, there were too many soldiers on leave so he could not go. Therefore, he spent time in Grenoble, France and was only able to spend one day in Nice. His return voyage to the United States was onboard a converted German freighter which took eleven days to arrive in Newport News, Virginia. He went to Fort Monroe temporarily and was sent to Camp Lee for discharge from the service. He was discharged from the service on May 1919. He took a train to Washington, DC, then a train to Philadelphia, PA where he ate at the YMCA. He then took a Reading RR train to Bethlehem and then took a trolley to Nazareth, PA.
Lewis then returned to work at the Penn Allen cement factory. On April 24, 1920, he married Jennie M. Keiper. The lived on 15 East Chestnut Street, Nazareth, PA. Virginia Mabel Wolfe, was born on November 22, 1920. Then they moved to Whitfield Street in Nazareth where they lived there for several years. Lewis "Sonny" was born on October 17, 1922 two years later. Then a still birth child was born in 1924. In 1926, the family to a small house on New Street in Nazareth. Virginia started school while they were living there. The lived in the house for six months before they moved to 152 S. Broad Street in Nazareth in 1927. The house was really great because it had electric lights! In 1928, Lewis returned to work at the Kramer Hosiery Mill, PA. He was later fired when he joined a union. In 1929, a fourth child was born, Paul Milton Wolfe. Sadly, he died five days later. In 1930, Lewis began working at the Quakertown Hosiery Mill until the stock market crash. In 1933, the family moved to 115 S. New Street, Nazareth, PA, and lived in a half duplex home. Then, in 1937, Lewis began work in the Washington New Jersey Hosiery Mill because of excellent, $1.40 per hour which was good pay in 1937. In 1940, he changed jobs and began working at the Nazareth Cement Company where he worked for .65 cents an hour.. He was age 44 at this time. During the World War II, he worked in the machine shop at the Nazareth Cement Company. In 1946, he became a Mill foreman where he worked rotating shifts days, evenings, and nights. Lewis retired in 1961 at age 65 and the family moved again! They moved to an apartment located at 38 East Prospect Street, Nazareth, PA, which was a first floor unit. On December 2, 1967, Jennie had a stroke which left her aphasic which prevented her from speaking. She spent one month at St. Luke's Hospital in Bethlehem, PA, and two months at Muhlenberg Medical Center undergoing treatment and was home for three months before she returned to St. Lukes for one month and then to Muhlenberg Medical Center until she passed away on September 2, 1968 at age 78. In 1970, Lewis underwent cataract surgery and then lived with Virginia (Wolfe) Smith in Perkasie, PA, while he recuperated from the surgery. On October 26, 1970, Lewis celebrated his seventy-fifth birthday. On February 24, 1971, Lewis' brother Leo passed away. On April 1971, Lewis returned to his apartment Prospect Street in Nazareth, PA.
Lewis Wolfe died on September 28, 1977 while at St. Luke's Hospital as result of a massive heart attack and respiratory failure following hip surgery. Lewis had fallen while going to church. His surgery was delayed because of emphysema. Lewis drove the following automobiles. Virginia obtained this information directly from her father, Lewis Wolfe.